In the current edition of ONE, journalist Anubha George reports on the inspiring work among the poor with a mobile clinic Healing the Forgotten in India. Here, she offers more details from her visit. It is the end of October. The roads are winding. We’re driving up the hills. The Sun is at its scorching peak. The weather is humid. We in the Kanyakumari Social Service Society (K.K.S.S.S.) ambulance are sweaty and thirsty. But the morale in the team is at an all time high. It’s as if nothing can faze them. There is no urgency as the palliative care team visits one home after another. It’s as if serving the community is their one and only purpose. That is the one thing I take away from them: that service is a calling. There are people in this world who go to absolutely any length to help others, without expecting anything in return. K.K.S.S.S. was set up in 1972. It is the social development arm of the Diocese of Thuckalay in the southern Indian state of Tamil Nadu. K.K.S.S.S. runs a mobile ambulance which provides palliative care for people who are very poor and have nowhere to turn to for help. This morning, the Rev. Vinu Joseph is leading the team of a nurse and three volunteers. We go high up in the hills. It’s a tribal area. It’s an actual forest. Tigers and wild elephants can be spotted. Health services aren’t easily accessible to people here. We park the ambulance by the foothills and start to climb up. A two mile hike later, we’re at Vijay Kumar’s home. It’s a hut. He’s 52 and had a stroke a few years ago. Doctors said it was caused by high blood pressure. Vijay Kumar wasn’t even aware he had high BP. His daughter stands by the door with her two children. One is a toddler, the other an infant. There are big poisonous spiders weaving their webs all around. A dog guards the hut. There are some hens and chickens running around. Vijay Kumar is bed ridden. He has been so since the stroke. His wife welcomes Father Vinu as he walks in. I’m too scared of the spiders to go in. Vijay Kumar puts his hand out. I hold his hand from outside the window. Members of the K.K.S.S.S. team have known the family a while. Father Vinu prays. The family are Hindus. But they’re glad that someone’s come to check up on them. They’re happy that someone prays for them. Vijay Kumar’s daughter tells me they appreciate the support and help. It turns out that the K.K.S.S.S. team make this trek up the hills just to check Vijay Kumar’s blood pressure a couple of times a week. All that just to check up on one person? I ask Father Vinu if that’s worth it. His reply touches my heart. Read more in the December 2018 edition of ONE. Students gather outside Sacred Heart Balanagar Hostel for Boys, near Cochin. In the current edition of ONE magazine, Anubha George writes of how the church is continuing to care for children in India, despite some significant changes in the country. She offers some additional impressions of those she met below. I still think about my visits to orphanages in Kerala. It was about a month ago that the photographer and I set on our journey to see how a change in Indian law has affected Christian institutions that have taken in children who have either lost both parents or are from single parent families. This new law, the Juvenile Justice Act 2015 has brought big changes in how orphanages in India are run. It wants institutions to have a lot more staff than they previously had, and there is a restriction on foreign aid, among other things. We chose three orphanages to visit. Well, we shouldn’t call them “orphanages” any more. All three places have had to change their status. They are now boarding places or hostels for boys and girls. Kerala has a big number of places that helped look after children. They are all pretty much missionary-run, and mostly Christian. I understand the concerns of the Indian government: there have been reports of child trafficking in India. Children have gone missing without a trace. But what we saw were stories of success. Girls and boys who wouldn’t have otherwise stood a chance in life have gone on to do good for the society. Some have become nurses. I remember meeting this group of girls, their faces happy and shiny, singing for us. They all came from families that are broken—where the parents aren’t together, where the mother or father has left to set up another family. Their parents are daily wage workers; no one has steady income. Where they live, the houses are so close together that it’s all considered one big place to live— where men from neighboring houses come and go as they please. Abuse of girls is common. Safety is the biggest concern. It is in this context that these institutions are a necessity. I remember in particular the story of one girl. She was three when her father attacked her mother, as the little girl stood watching. Her mother had, perhaps, been unfaithful. Her father then butchered the body into pieces and tried to burn it. The neighbors reported him to the police and he was arrested. But the girl, who is now seven years old, remembers it all. The headmistress of the nursery she used to attend brought her to an orphanage. Here, she at least has some kind of normal life. A life of routine and love; of prayer and belief; of safety and security, where she doesn’t have to wonder where the next meal will come from or when is the next time she will have a bath. Then there was a boy, Abin. His parents have left him and his older brother in Kerala while they live in Delhi, hundreds of miles away. Actually, we never quite figured out what his parents do. I don’t think he knows why he is there at all. All he remembers is a promise: that he will go back to be with mom and dad when Christmas comes. When that Christmas will come, no one knows. But for now, at least, he has other boys, who play and smile with him, to be there every Christmas until then. Read more in ‘Our Doors Are Open’ in the September 2018 edition of ONE. 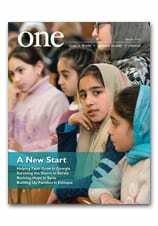 In the current edition of ONE, writer Anubha George takes us to A Refuge to Mend and Grow, where the Bethany Sisters are helping forgotten and abandoned women. She offers some additional impressions below. After an eight-hour journey from Kochi, we begin our climb into the mountains of Wayanad in north Kerala. Fourteen hairpin turns later, where we see monkeys snatching food off people, the air turns cold. Gone is the humidity of Kerala. This feels a bit like the Indian version of the prairie —it’s spacious and very breezy. The air is clean and there are tall coconut trees all around. It is indeed a very picturesque part of the place known as “God’s Own Country,” Kerala. There are two friendly faces waiting for us at the Trippadam Psychosocial Rehabilitation Center in Sultan Bathery run by the Bethany Sisters. We meet Sister Tabitha and Sister Darsana. Along with three other sisters, they look after 50 women who stay here. These women have been abandoned by their families because they suffer from mental health problems. Some of them will be here until their dying day. There’s medical help available here from the local government-run hospital; women can receive an assessment and monthly follow-ups with a psychiatrist, along with free medication and regular counseling sessions. There are many challenges. The building is old; it was once a convent before it became an orphanage. It needs repairs. But in the middle of all this, the sisters offer a place of welcome and peace. The sisters have created a sense of community and well-being for those who are with them; they give the women a feeling of security and of being loved. There’s a purpose to their lives— a life of routine. The day here starts at 5.30 am when the women are given coffee in bed. Then there’s prayer and meditation, followed by Mass. After breakfast, it’s on to chores around the center, such as cleaning and cooking. There’s also the garden to take care of, and chickens and cattle that need looking after. After lunch, it’s nap time. In the evening, there’s prayer outdoors in the garden (where there’s a little chapel) and then it’s lights out at 9 pm. Throughout the day, there’s significant focus on prayer, alongside medical help and emotional support. The sisters believe it helps calm down the women. It gives them a sense of well-being and makes them feel that they’re not alone but that Christ is with them at all times. Read more from Anubha George in the June 2018 edition of ONE. In the current edition of ONE, writer Anubha George visits Indian seminaries where future priests are studying. Here, she offers some personal reflections on the assignment. Long winding roads; the green of the Kerala countryside; tall coconut trees and a flash of backwaters every few miles. All this crisscrossing led us to three very different but equally important seminaries in Kerala. It is here that future generations of priests in India are being trained to devote their lives to Christ and community. We had gorgeous weather on our travels. Kerala gets boiling hot and humid come end of February/early March. But the beginning of February is breezy, comfortably warm and the humidity is tolerable. We needn’t have worried though. The seminaries we visited: Mary Matha major seminary in Mannuthy near Trichur; St Thomas Apostolic seminary in Vadavathoor near Kottayam, and St. Francis Theological College in Thellakom had one thing in common — apart from training priests, that is! They all had lots of trees — coconut, banana, banyan, jack fruit, tapioca plants, to name a few. It was cool in these seminaries. Another thing that struck me over and over again was the wonderfully positive energy in each of these places. They are all beautiful and imposing buildings, away from the maddening sounds of the city. It’s peaceful and quiet here. You can see why the church has chosen to train future priests here. There are no distractions. Just peaceful buildings located in quiet and small communities, where the young men learn how to support and bring people together. The chapels in all three seminaries made an impression on my heart. It felt like Christ was present here. The Capuchin seminary chapel was designed by the men themselves. It showed the world turned into one single nest through the Divine. The church respects the fact that an understanding of different religions is needed in this day and age of conflict and controversy. Interfaith understanding is encouraged. Brothers are taught about other religions and are trained in how to have fruitful and positive dialogue with people from other faiths. The pastoral training is tough. It is long and many people quit. But those who stay are determined to make a difference. We met many such brothers and deacons. They are clear in their purpose — to live their live in the way Jesus did; to make parishioners see Christ in them. All seminaries run programs to help communities, such as providing support to people with AIDS; helping poor and underprivileged do their school and home work; counseling families to sort out their family problems; and organizing retreats for spiritual guidance. Young people from the local communities are especially encouraged to participate in activities organized by the local parishes. Visitors are always welcomed in the seminaries. At every seminary, we were offered a delicious lunch cooked with organically grown vegetables. Three days. Three seminaries. Three villages in interior Kerala. Not once did it feel like a chore. We came away feeling refreshed from each of these places. Read more about The New Priests in the March 2018 edition of ONE.